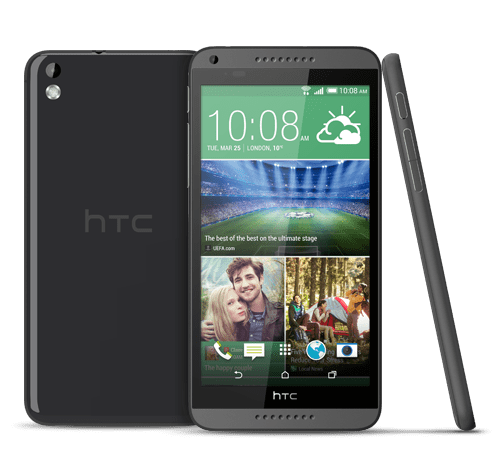 HTC had recently announced the HTC Desire 816 Android phone with some mid-range specs, and the phone was showcased at the MWC 2014 event. The device has a 5.5-inch touch screen and a HD display. The phone is available in the European market, China, India and soon hitting the stores in US, according to sources. The HTC Desire 816 has a 5.5-inch super LCD2 capacitive touch screen with 16M colors. The display has the HD resolution with 720×1280 pixels giving a pixel density of 267 PPI. Having a thickness of 7.99mm and a weight of 165gm, the Desire 816 won’t be that comfortable to hold, but is quite thin due to the large screen. As is the case with most of the other HTC smartphones, the design looks good, and it differs from the entire Desire series on the front, because of the Boom Sound speakers located on the front. Internally, the device is powered by Qualcomm Snapdragon 400 chipset, a quad-core one clocking at 1.6GHz and this has the support of 1.5 GB RAM. The storage capacity of the device is 8GB internally, with the Micro SD card slot for storage expansion to a maximum of 128GB. The device runs Android 4.4.2 out of the box, and that would be topped by the HTC Sense 6, the latest interface version from the company. Coming to the camera, the Desire 816 comprises of a 13MP rear camera with auto focus and LED flash, and the camera can capture Full HD 1080p videos. On the front, there is a 5MP camera with 720p video recording. The camera features include Geo-tagging, Touch-focus, face detection, simultaneous HD video and image recording. There are some features continued from the previous flagship devices, such as HTC Zoe, automatic highlight videos etc. On the front part of the phone, HTC has provided the Boom Sound speakers, and these are present both on the top and bottom in the front, taking the place which usually the buttons in the bottom take, but here, the buttons are in the screen area above the HTC branding. The battery capacity of the HTC Desire 816 is 2600 mAh, which is the same as in the HTC One M8, and it is a non-removable battery. The mobile comes with the Wi-Fi version 802.11 b/g/n, DLNA and the Wi-Fi hotspot. Based on the different markets where it is going to be sold, the data network connectivity options would differ as there is 4G connectivity available, but it’s different from Asia, EMEA and China. The Mobile is available in Black, White, Red, Gray, Green colors. The Desire 816 is available in the Chinese market, India and European market for now (May 2014), and the availability is going to be extended to the following countries very soon: UK, Spain, Portugal, Germany, Italy, France, Czech Republic, Poland, Austria, Hungary, Bulgaria, Sweden, Norway, Switzerland, Serbia, Lithuania, Latvia and even more European countries. The price of Desire 816 in India is Rs. 23900, and in Romania, it is available for 1,299 RON (which is around USD 405), while in the Chinese market, the pricing of it is 1,899 CNY. Before the launch, the device had topped 1 million pre-registrations in China where people just had to register themselves and not pay anything until the phone actually enters the market.